← Creativebug Black Friday Sale Starts Now! Treetopia assembled a super cool Design Council for their Christmas in All Shapes and Sizes campaign, and I am so honored to be a part of it! I have sort of a roundabout answer to this, as my Christmas tree is really about starting to create new traditions in my own home, rather than representing unique traditions from my family. After moving out of my family’s house, I didn’t have my own tree for a very long time. I was kind of afraid to start gathering my own set of ornaments when I was basically moving to a new apartment every year. 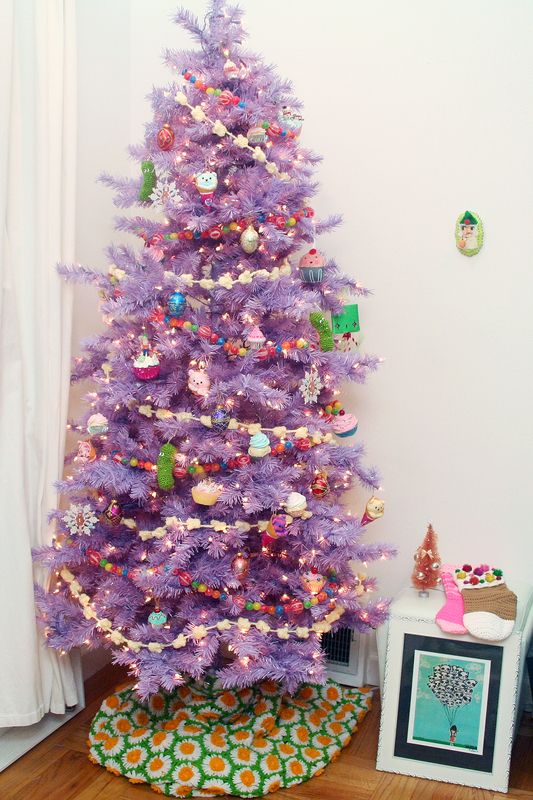 When I finally got around to buying my own (faux) tree a few years ago, I decided that I wanted to only buy handmade or vintage decorations, and this is what I’m showing here for the Christmas in All Shapes and Sizes campaign. I like putting new spins on classic Christmas traditions, such as stringing popcorn into garlands and finding the Christmas pickle. 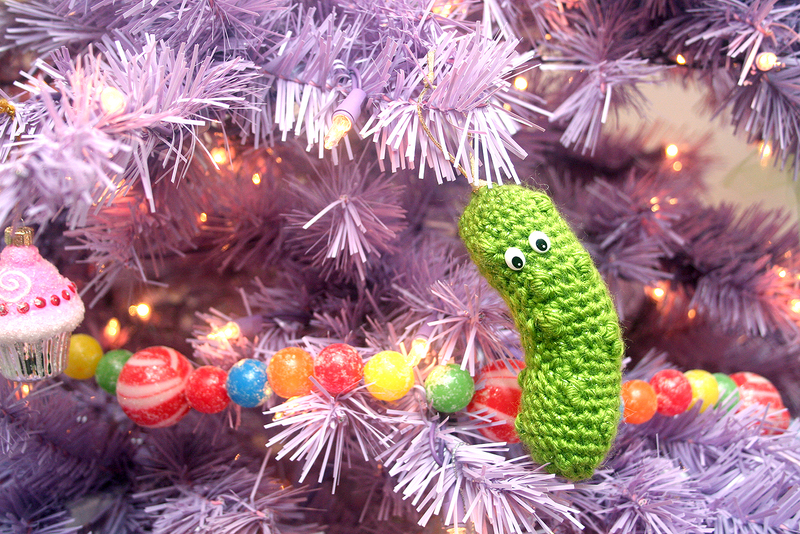 My popcorn and pickles are crocheted! 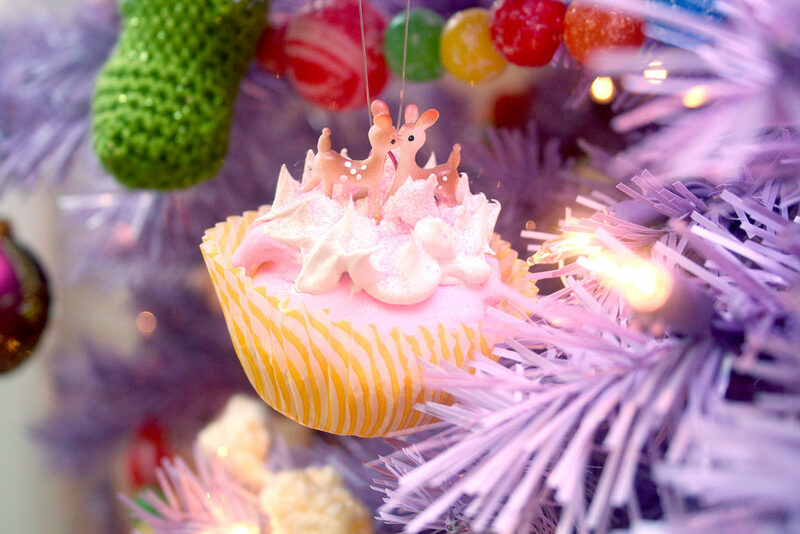 And since I just love food-themed decor in general, I have a lot fun, kitschy cupcakes in my tree, too. I admit that I broke a little on the handmade/vintage mission when I hung some cute keychains I purchased while in Tokyo in October, but “re-purposing” might still be on theme! 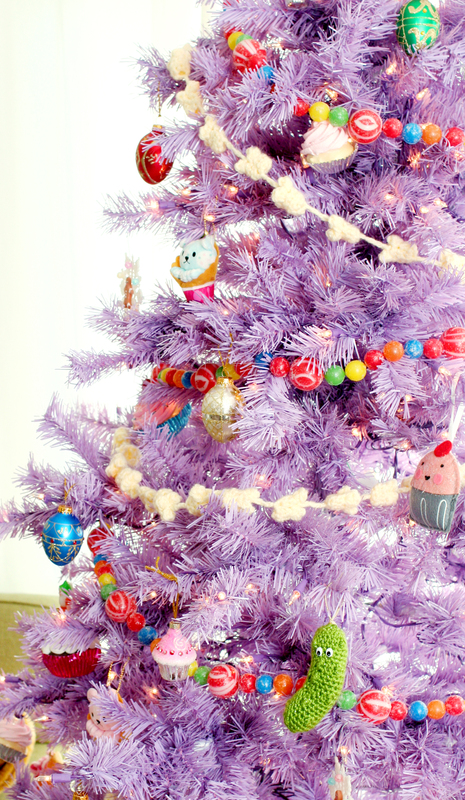 My personal mission as a crafter has always been to add more fun and color to my life and the world around me, and my candy-coated lavender tree definitely fits the bill! My older tree is pink, which I have a vintage red tree-skirt for. But I’m one of those people who doesn’t like mixing purple and red, so I threw down this vintage flower-loom afghan! I love anything that screams technicolorgranny! 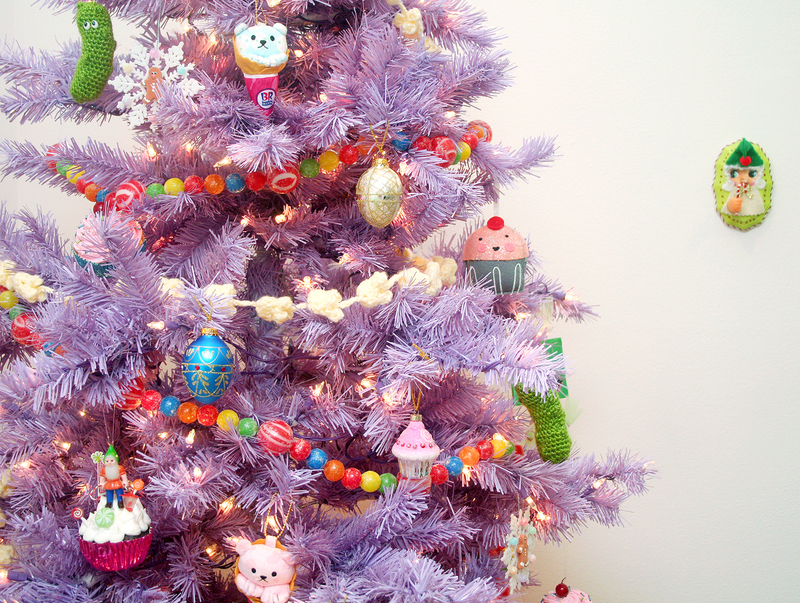 Ok, I broke my handmade/vintage rule a bit here with these Treetopia Artisan’s Glass Egg ornaments, but I think that gifted ornaments can count, too :P. I liked these lil guys because they reminded me of ornaments from my tree growing up. I probably accidentally smashed a few… and in grand tradition, I actually already dropped one of these Glass Eggs on the wood floor… shhhhH!!! I can have nice things!!! I really love ornaments that have a little tiny story on them, like these two lil smooching deer!!! 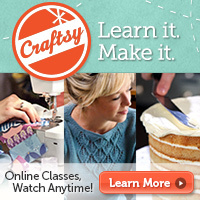 I am also in desperate need of an amazing tree-topper. I have gone years without one, and I want the best one! 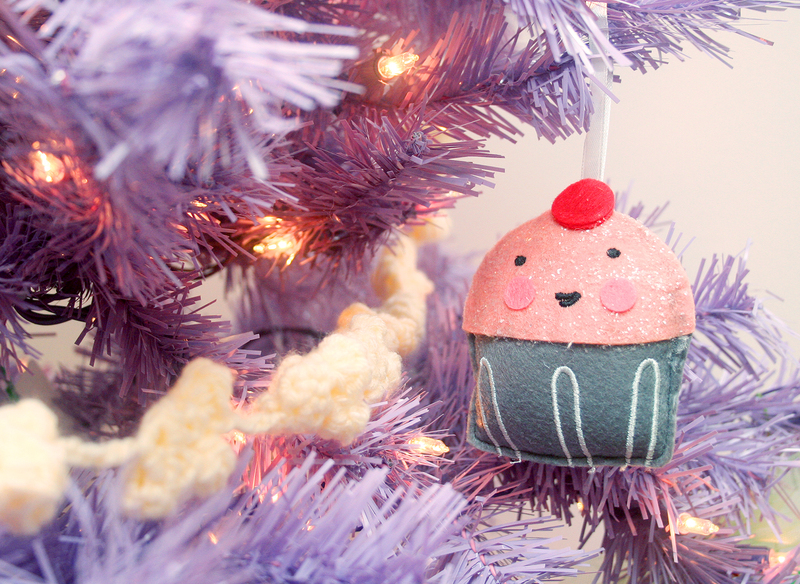 I actually have a few more kitschy cupcake ornaments on the way, being handmade as we speak! My current fave shop for this kind of decoration is 12LegsCuriosities on Etsy. 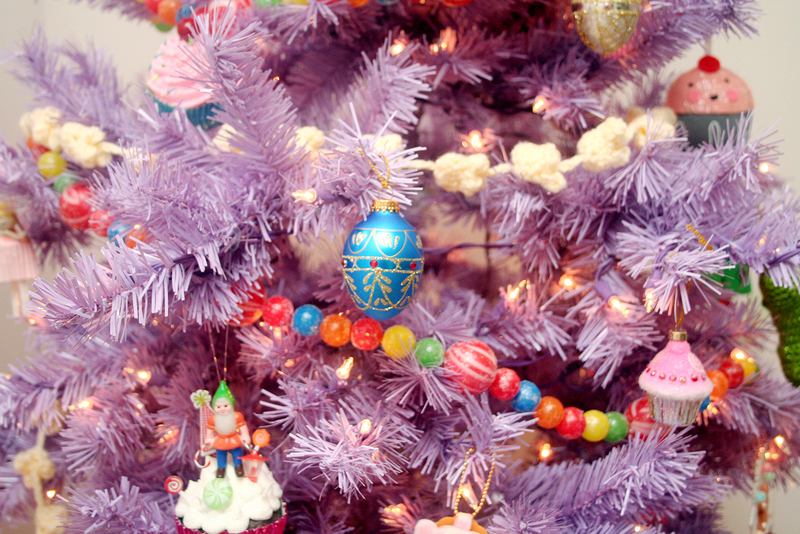 Please check out the other Design Council Bloggers’ trees and their holiday family traditions on the Treetopia blog! 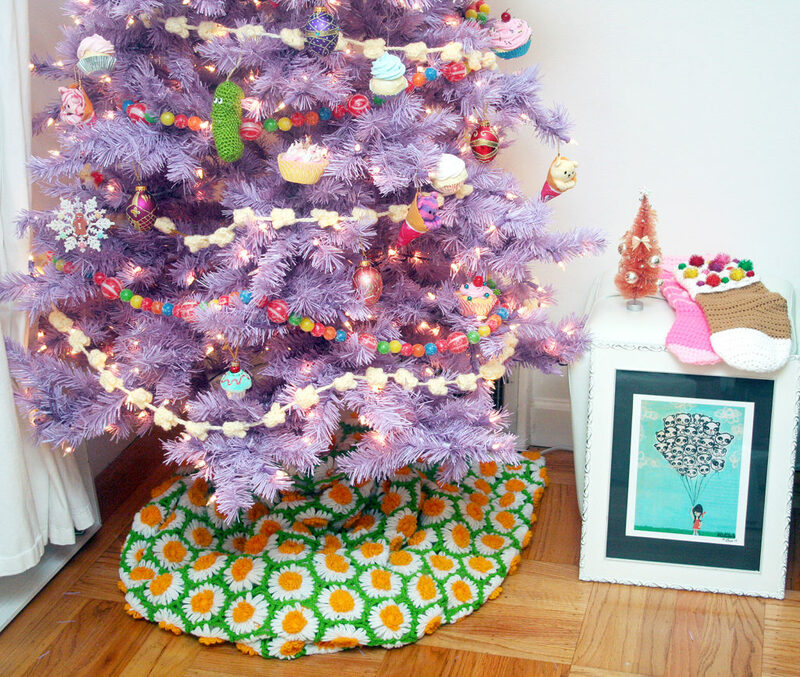 Two trees/bloggers per day have been going up this whole week. BUT WAIT. THERE’S MORE. Treetopia is giving us the opportunity to give one lucky winner a $150 gift card to shop at Treetopia. That’s pretty dang spiffy if you ask me! All you have to do to enter is to comment my blog with your favorite one-of-a-kind family holiday tradition. 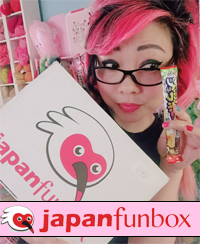 I know that I just asked this in my group giveaway, so if you wanna mix it up, you can also answer with your favorite holiday treat/drink/side-dish/snack as well! You can enter until next Wednesday, November 30th, at midnight! A winner will be chosen randomly by Random.org. P.P.S. 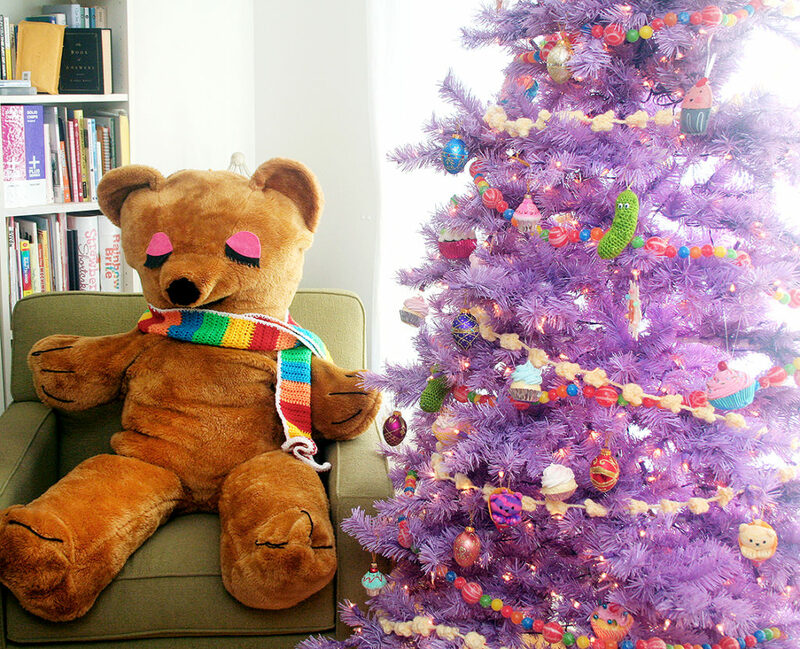 Here is an outtake from when I had the room arranged a bit differently, but I felt like Bearry Ham (long story) was lookin a bit weird, so he sat the rest out. 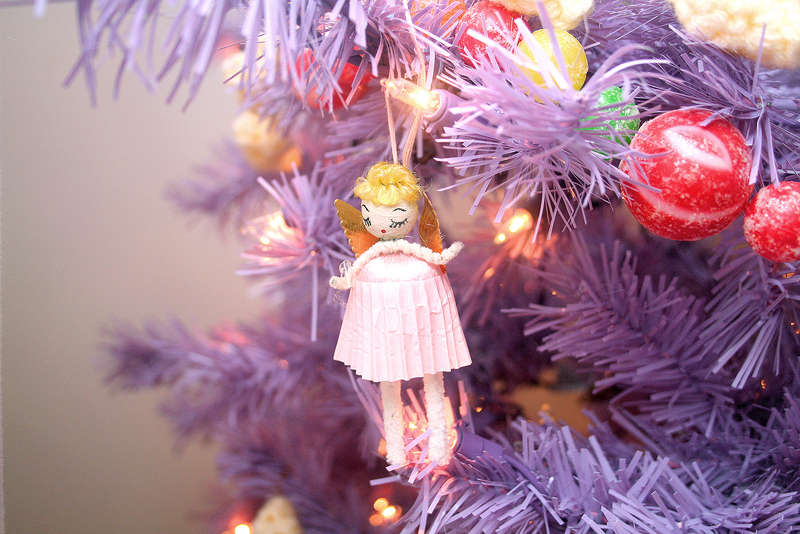 One tradition that I started a few years ago is making everyone handmade ornaments. 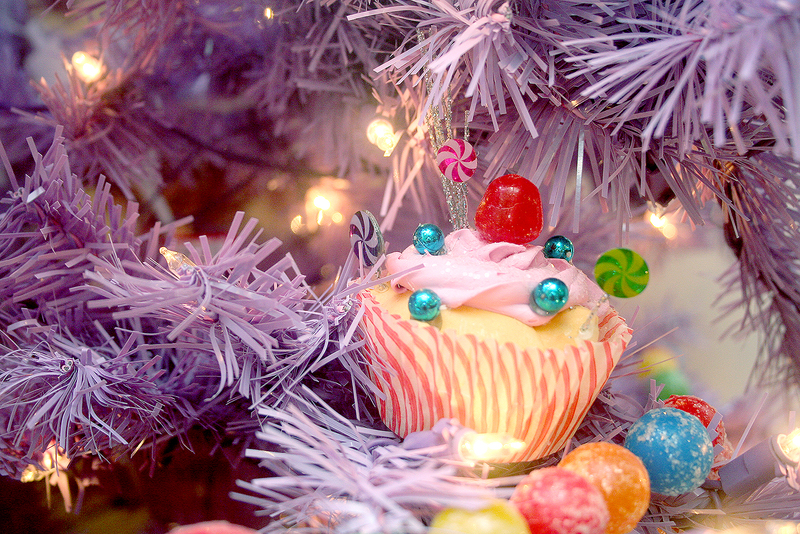 I’ve made donuts and gumdrops – I haven’t decided what to make this year! My favorite holiday tradition is staying up as late as possible with my brother to watch A Christmas Story over and over and over again. Even after we grew up and I moved away, I came back for Christmas Eve for this tradition with him. My holiday tradition is to have Christmas dinner off of the fine China then all go see a movie at the movie theater! My favorite year so far was back when Marley and Me was in theaters! I love Christmas. My Mom’s homemade eggnog with Southern Comfort was the best. This Christmas will be hard because it is the first Christmas without her & all of my Christmas decorations are in storage this year, I had to move & staying with family temporarily. I need a new Christmas tree… but thankfully I just returned home from Once Upon a Christmas craft event by Jennifer Hayslip in Charleston, South Carolina (I heard about it from @Jennyeveryday, & got to meet Jenny & Aaron & created one of their plaques) I have a little pink tree that I decorated with all of the little ornaments that I was gifted or bought on this trip. My tradition with my children is to buy them an ornament every year since they were born, & when my daughter moved out, she took her ornaments with her for her own first tree. My son will take his ornaments one day too & now my son-in-law is added to the tradition. I love finding just the perfect ornaments for them. My long-held family holiday tradition is making sushi on New Year’s Eve for a huge seafood brunch (complete with crab, fried wontons, ozoni Japanese soup, deviled eggs, etc.) on New Year’s morning. We find Glogg and Kinderpunsch and those are our go-to drinks for the season! Our traditions are to order pizza and watch movies together on Christmas Eve and have a big dinner on Christmas Day with extended family and gifts.